I recently had the opportunity to visit Research Triangle Park in North Carolina, when I attended the National Association of Science Writers annual conference. There are many perks to attending the NASW conference — including meeting amazing science writers and learning about the great research going on at other universities around the country. But one of my favorite perks is the field trips! This year as part of the field trip portion of the conference, I visited the newest facility built by Medicago Inc. with 20 or so other science writers. While I had a general idea of what I was getting into — checking out a flu vaccine plant — I was in for a treat at this super-efficient greenhouse and laboratory. When we rolled up on our tour bus, we were quickly escorted into a conference room where I swear a version of the cast of The Big Bang Theory awaited us. Everyone was friendly and seemingly eager to tell us all about what they do. And no wonder. They’re pretty much going to save the world. Medicago — rhymes with Chicago — was basically given a challenge by DARPA (the Defense Advanced Research Projects Agency): create and perfect a process to produce 10 million doses of a pandemic influenza vaccine. Oh wait, and not just that — the process needs to take no more than a month. My new Medicago friends rose to the challenge. The most common way to develop a flu vaccine is to incubate the virus in a fertilized chicken egg. Medicago is using tobacco plants. 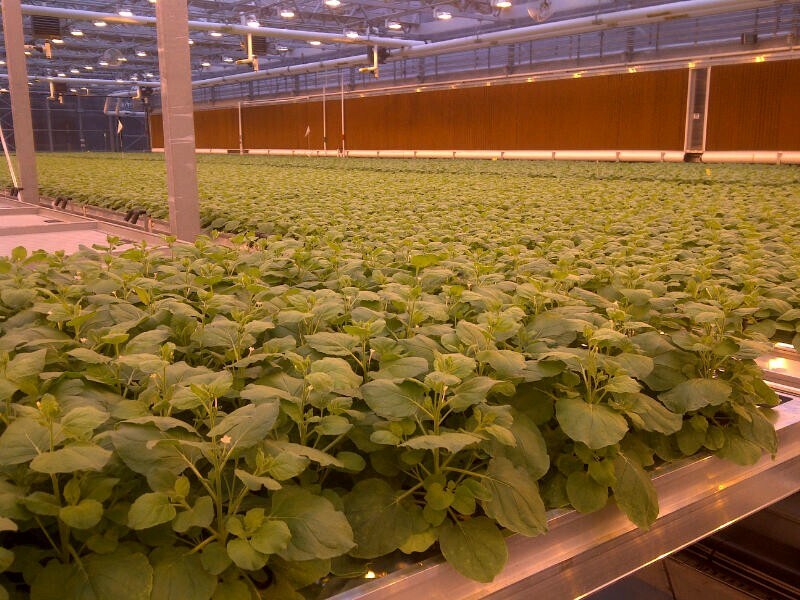 The plants can be created more quickly and the virus incubation time in the tobacco plant is less than in the egg. Medicago succeeded, and received a $21 million dollar grant from DARPA. So should the nation face a flu pandemic anytime soon, DARPA will call on them to produce these vaccines, stat. We got a tour of their very new facilities — they were completed about a year ago — and saw the greenhouse and the equipment used to infiltrate the tobacco plants with the virus. I might have been exaggerating a bit when I said Medicago is going to save the world, but their technology is pretty neat. And I think it’s awesome that we can do something healthy and possibly even life-saving with tobacco. What will researchers come up with next?